Admit it. Even the best of us have had those moments where our inner Scrooge has screamed "Bah humbug!" to all the Christmas cheer. Sometimes, you just want it all to go away. Enter DC's "Main Man", Lobo, who is more than willing to step up and give a big middle finger to the ho-ho-holidays. Keith Giffen and Alan Grant pen the perfect anti-Christmas special, with 40+ pages of yuletide ultraviolence, brought to life by legendary artist Simon Bisley. The fun starts when a drunken Easter Bunny hires Lobo to take out jolly ol' Saint Nick with extreme prejudice. It seems that the fat man has gotten a little too big for his britches, overshadowing the hard work of all the other holiday mascots. After staging an all-out assault on Santa's Workshop, Lobo finally faces off with Kris "Crusher" Kringle in a fight to the death. 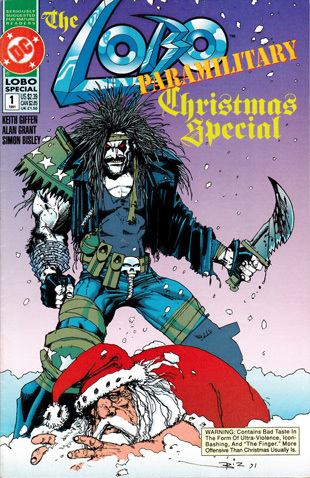 Naughty or Nice, the Lobo Paramilitary Christmas Special deserves the top spot on any comic fan's Christmas list.